It’s Friday! That means a Filofax post. 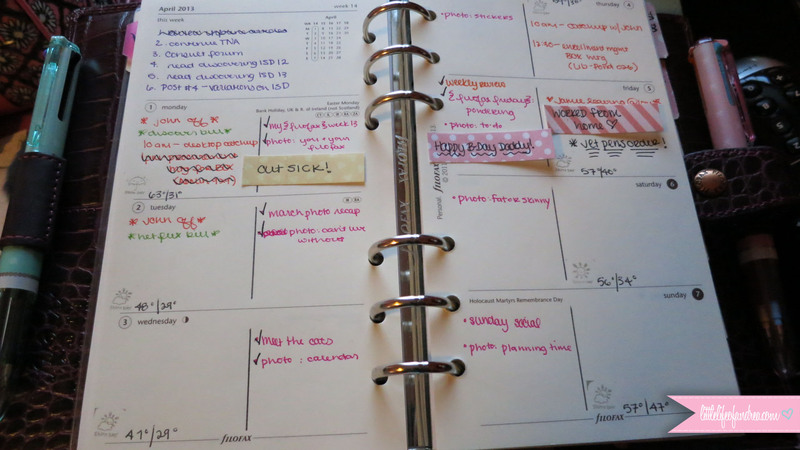 This week, I’m giving some quick updates on how the changes in my Filofax are going. I mentioned in my most recent “Week” post that I was experimenting with the Cotton Cream Wo2P inserts this week. I’m happy to say that I think they are here to stay. I love the space, and I feel like I can be a bit more creative. I just wish Filofax would start making the rest of my inserts in Cotton Cream so that my OCD wasn’t bugging me. That’s not the only thing that’s changed. I did go ahead and swap out my Month per page plus Notes inserts for the Month on 2 Pages even though I said I wasn’t going to. Admittedly, I’m not using them much right now, but I didn’t use my Month per page ones either. The big difference is that it involved switching up the layout a bit to have all the monthly pages together rather than interspersed in the weekly pages. So far it’s not too big of a difference since I didn’t use them much anyway. My most favorite additions though are two new Coletos. I happened to be browsing Jet Pens the other day and noticed a whole bunch of new Coleto bodies on there. I’ve been seeing some others pop up in some photos on Flickr as well. Now I love my Black 5-barrel Coleto, but it does have a bit of a cheap look to it. I’ve been keeping my eye open for new Coletos that looked a bit nicer. These two 3-barrel ones from the Sweet line (pictured & linked below) found their way into my cart first. They arrived quite quickly as always, and I adore them, so much so, I’ve decided I want the 4-color barrels instead so they are on their way to me now along with the other two colors blue and peach as well. I mean how cute are they!? It’s hard to see from the pictures, but the mint green one has asterisk-like symbols on it. The pink one has little bows. They all have a little dotted silver band where the pattern ends. and Black of course for everything else. If you haven’t tried a Coleto pen, definitely check them out. They are by far my favorite. I ditched my Frixions for them, and they make having one pen loop in a Filofax a bit more bearable (provided it’s elasticized). That’s it for the update!